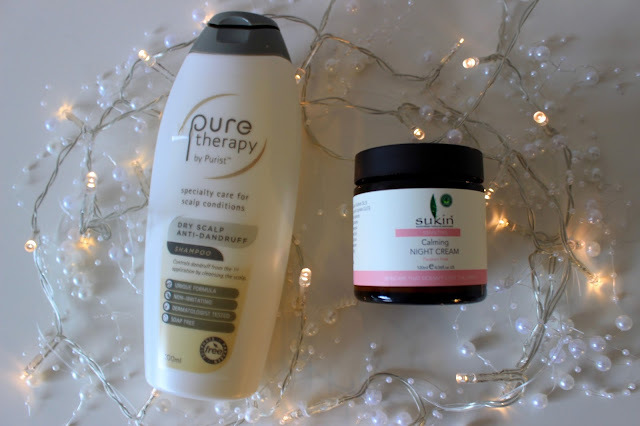 This month from My Pure I choose to try Pure therapy dry scalp shampoo and Skin calming night cream, both of which I hadn't saw on the My pure website before so I was quite excited to try both. Firstly is the pure therapy dry scalp shampoo which I choose as I have eczema and both my face and scalp get very very dry so finding a shampoo that works for me can be quite hard so this seemed like the perfect fit. I've been using this since I got it and I honestly love it, I find a lot of shampoos that are for dry scalps can leave my hair quite frizzy and just generally not feeling great once it's been washed but this left my hair feeling super soft without drying my scalp out which is amazing! I'll definitely be purchasing this again. Secondly I choose the Sukin calming night cream containing both cucumber and chamomile to sooth the skin, I have used this for a few nights now I wouldn't say it has helped with my dry skin which doesn't surprise me as its so dry but it did help relax and take the red out of my skin, I would say this is more for people with normal skin than dry but I'll definitely get lots of use out of this when my skin isn't so dry. I did like that this was thick and rich but without being too heavy. Overall I really enjoyed using both products this month, both can be found over at the MyPure website along with plenty of natural skincare and makeup products.